Regular maintenance can extend the life of your awning fabric and keep it looking new. We recommend that you hose off the fabric off every month with clean, clear water. This will help keep dirt from deeply embedding itself in the RV Awnings fabric and reduce the need for deep cleaning. Unless you live in a harsh environment, you should only need to deep clean awning fabric every two or three years. When the time comes for a more thorough cleaning, RV Awnings fabrics do not need to be removed from the awning frame before they are cleaned. If size permits, they can be removed to help with tough stains, but it’s usually not necessary. Knock off the loose dirt. Hose off the awning with water. Prepare a cleaning solution by combining water and dish soap. Dawn dishwashing liquid is an excellent choice. Use a brush with soft bristles to scrub the fabric. Allow RV Awnings fabric to soak up the solution. Thoroughly rinse all cleaning solution from the RV Awnings fabrics. Depending on the fabric, rinse and repeat. If you can’t remove a stain with the above steps, consider using a stronger degreaser or a diluted mixture of soap and bleach to remove mildew and other tougher stains. RV Awnings fabrics do not promote grow mildew on their own, but other substances such as dirt on the fabric can cause mildew to appear on your awning fabric. Prepare a solution that combines 1 cup of bleach and one-fourth cup of soap for every gallon of clean water. Soak the solution into the RV Awnings fabric for roughly 15 minutes. Using a soft bristle brush, gently scrub the desired area. Thoroughly rinse all soap from the fabric. If you use a bleach solution, you will need to clean it again with soap and water. 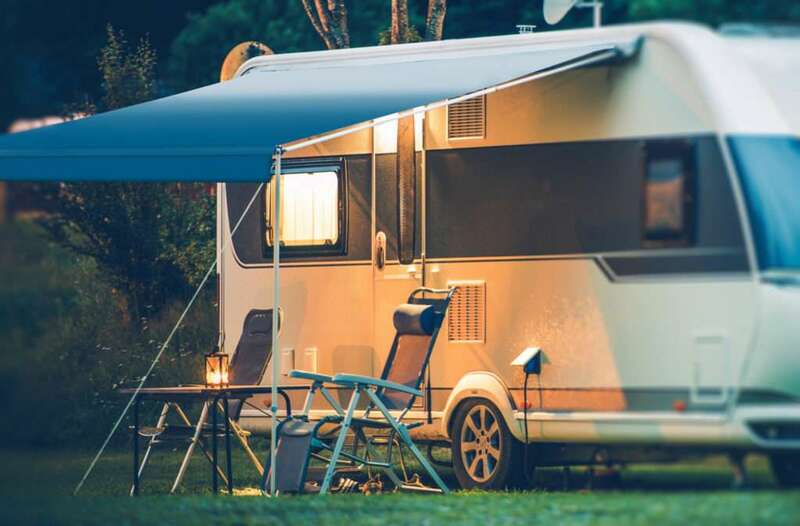 RV Awnings fabrics are often treated with a water and stain repellent finish that is meant to last for many years, but after a thorough cleaning (especially if bleach is involved) some replenishing may be required. We recommend using 303® Fabric Guard ™. Clean awning fabric, using one of the methods mentioned above. Allow time for RV Awnings fabrics to completely air dry. Apply the retreatment in an area that is well-ventilated following the directions on the container. You may also have a professional awning cleaning company in your area. When evaluating the services of a professional, you should ask about the company’s experience in working with RV Awnings fabrics and knowledge of cleaning and re-treatment procedures.